There are few pleasures in this life more exquisite than walking a quiet beach at sunrise. Cayucos Beach and (the north end of) Morro Strand Beach offer a special bonus if it also happens to be low tide. The many rocks that dot the beach and surf here become exposed as the tide ebbs. The cracks, ledges, and depressions that remain moist or partially filled with sea water are called "tidal pools" or "intertidal areas". Here, beachcombers may view a beautiful profusion of sea life. 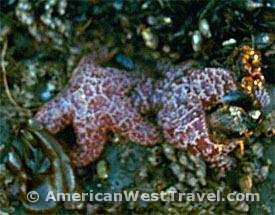 Left, a rock hosts a spectacular profusion of colorful starfish. A large sea anemone (the round object) is anchored just above the orange starfish. The prevalent brown algae provides protection and nourishment for the animal life. Above, a starfish closeup. 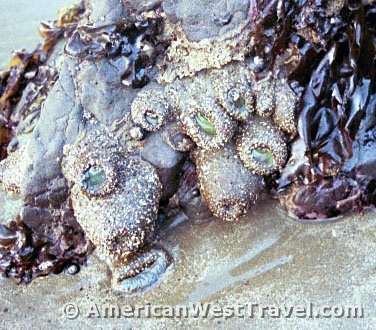 The mobile animals of the tidal pools have a somewhat more difficult life than the sedentary inhabitants such as mussels and barnacles (pictures below) which cling cement-like to the rocks. Creatures such as starfish, sea urchins, and crabs must endure the immense power of the rising tide twice daily. The primary rule is hang on or die. Sea anemones, pictured right, fold their beautiful tentacles into their bodies and become inert blobs. This also prevents them from drying out when exposed to the air. Shown left, a solitary crab scuttles along the beach. He risks becoming breakfast for the many shore birds patrolling the area. Many tiny sand crabs dig small holes and live under the sand. If you jostle one of their holes with your finger, a group of them may make a quick exit. Small crabs may be found in profusion in the tidal pools. 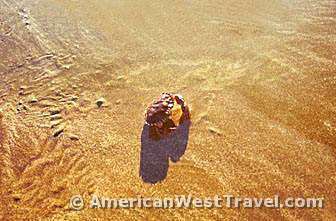 A fascinating resident is the hermit crab. The hermit does not have a shell of its own and will don the discarded shells of other small creatures such as snails or limpets. 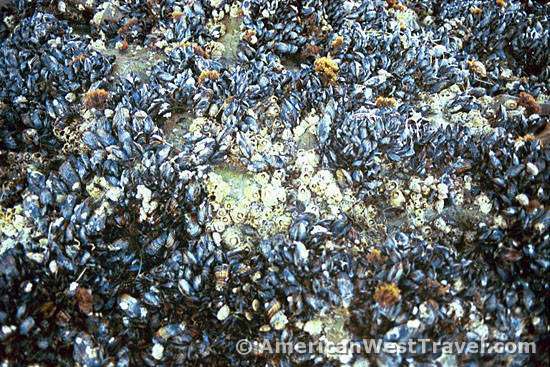 Huge mussel beds are a very common component of tidal pools. Click on either picture below for a very detailed enlargement. 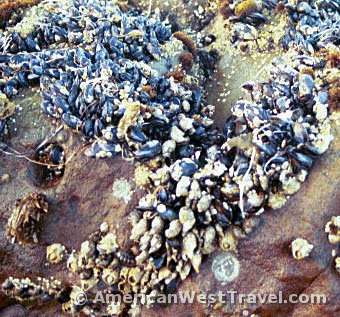 You will be able to see the mussels, barnacles, snails, etc. Photo left is 93k, photo right is 65k. 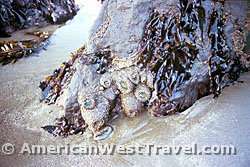 A large rock outcrop displays its dressing of sea life at low tide. This rock is well out in the surf and is entirely underwater at high tide. 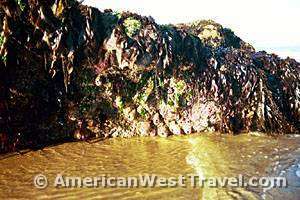 The predominant inhabitant of most tidal pools is the seawood, generally consisting of brown, red, or green algae. In this area it's mainly brown. Note the large cluster of sea anemones at the bottom center of the rock. PLEASE NOTE: Tidal pools and their sea life are protected by law! If you come, please do NOT take souvenirs! !